Among the half-dozen of so exercises in which I have always been particularly interested, is the two hands curl. I have always maintained that there is a basic movement which can determine the strength of any given section of the physique. For instance, the deep knee bend or squat is a pretty accurate means of measuring the strength of the hips and thighs; the dead lift with one or two hands determines the back strength; while the two hands slow curl gives you a good idea of the power of the arms in one of the two basic movements governed by them. Of them all, perhaps four stand out as the most powerful in the curl, in my opinion that is. 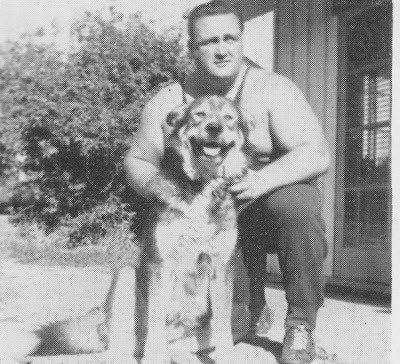 I exclude Louis Cyr because I fell that romance has played a large part in certain of his feats and there is, so far as I can ascertain, no existing proof that some of his lifts were actually performed. John Davis, Al Berger, Maurice Jones and Herman Goerner are to me the greatest curlers we have seen. All these men have curled 200 pounds or over with Herman Goerner heading the list with a two hands slow curl of 222 pounds. It is this record which I have personally worked to equal and then substantially surpass. I came close to doing so at the recent Mr. Eastern America show held by Joe Weider. I feel now that that if I had curled first, instead of having broken records in the deep knee bend, I would have made a 230 curl with little or no trouble. You see, I firmly believe that leg and back strength play just as important a part in the two hands slow curl, as power in the biceps. But I feel confident that if I continue to train along my present lines, utilizing the methods and theories I am submitting to you, I will be more than capable of exceeding Herman Goerner’s great record in the very near future. Now that I have explained my reasons for the use of the Power Principle in my training, I suggest you give it a try in your workout program. It will not make any great alteration in your type of development or appearance. If you are inclined to muscular definement, it might possibly give you a little more muscularity, but nothing too noticeable. If you are, as I am, inclined to a smooth, fleshy type of musculature, you will remain the same outwardly, but the muscles will harden a great deal. In my next article, I’ll give you some training schedules together with some important tips that will help you bring your curl poundage up and aid you in maintaining correct posture, thus gaining greater success during actual curling attempts.